Sweet, delicious, nutritious power bowl. WIll keep you full and satisfied for hours. Recipe: cook 1/4 cup oats in 1 cup almond milk ( 1/2 cup water and 1/2 cup milk) with 1 tsp chia seeds stirring now and the. When you see that oats are aaaalomost done cooking add 3 oz of mashed sweet potato, 1/2 tsp cinnamon, 1/2 tbsp raisins and stevia to your taste. Mix together and you will get this nice and thick oats. But wait, we are not done yet. Now add 2 tbsp pb2 and mix again. Done!!! Can you imagine the taste? 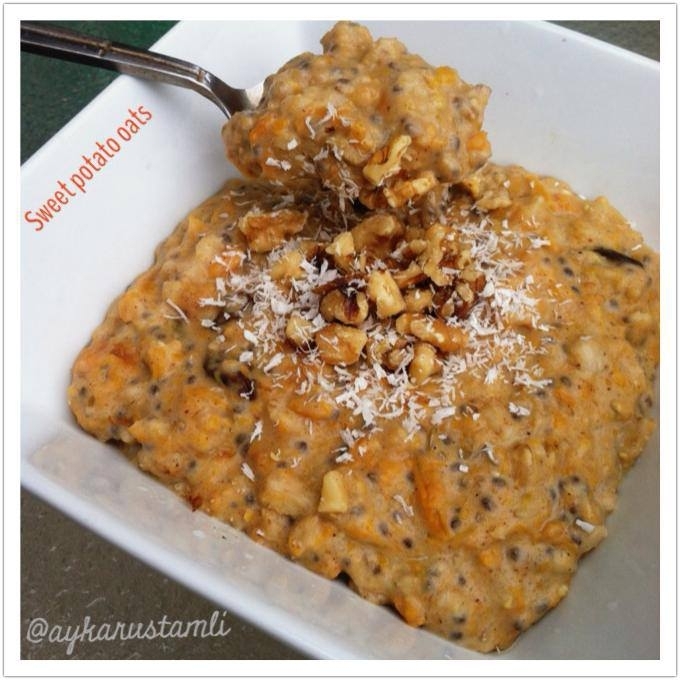 Oats, sweet potato, cinnamon and peanut butter all united? To die for!! Sprinkle with walnuts or unsweetened coconut flakes if you want.